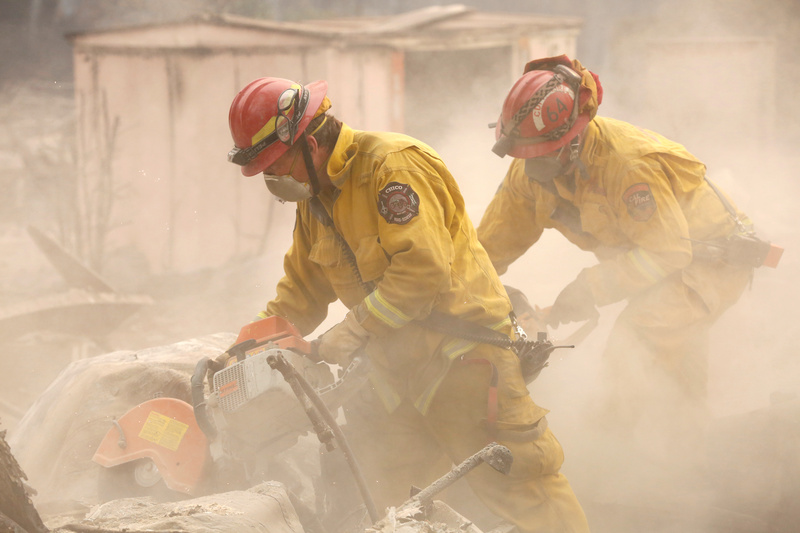 Cal Fire firefighters comb through a house destroyed by the Camp Fire in Paradise, California, U.S., November 13, 2018. PG&E said in a filing on Nov. 13 that it could be subject to significant liability “in excess of insurance coverage” if its equipment is determined to be the cause of the Camp Fire in northern California. The company also said that it has borrowed the full $3 billion available from its lines of credit, leaving it with nearly $3.5 billion of cash and cash equivalents, but it has “no additional amounts” available to borrow. The filing also stated that PG&E submitted a report to the California Public Utilities Commission about an outage its network suffered early on Nov. 8, the day that the fire started. It has killed at least 48 people, making it the deadliest wildfire in the state’s history. PG&E shares were down nearly 25 percent to $24.61 at 2:23 p.m. EST on Nov. 14.